Renesola (SOL) is a vertically integrated company with complete R&D and manufacturing of polysilicon, silicon wafer and solar modules. Renesola has a global presence with sales branches established in Europe, the Americas and the Asia-Pacific regions. Renesola sells solar panels as an OEM Solar Panel Producer which means that it sells its solar panels to companies who put their own brand names on solar panels produced by Renesola. 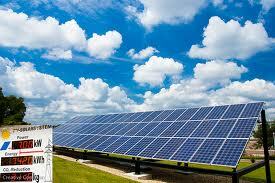 Read more about Chinese Solar Panels, prices, costs, reviews and manufacturers. Both Yingli Green and Renesola are amongst the best buys according to me in 2013. They are low cost Chinese solar panel producers. The different monocrystalline solar modules from Renesola are: i) 156 black mono (250w-260w), ii) 125mono (190w-200w), iii) 156square mono (260w-270w) and iv) 156mono (250w-260w). The multicrystalline solar modules from Renesola are: VIRTUS VIRTUS II series. The cell types found in Renesola are 125×125 mm and 156×156 mm. For Yingli modules, it is generally 156×156 mm. Yingli Green modules have a positive power tolerance of 0 W to+5 W, while Renesola Modules come with a positive power tolerance of 0-+5W. Weight for Renesola modules are 16 kg, 19 kg, 29 kg and Yingli modules weighs between 15 to 21 kg. Renesola modules have a limited product warranty – 10 years repair, replacement or refund remedy and 25 years limited peak power warranty – limited remedy. Yingli Green Energy modules come with 10 years limited product warranty and limited power warranty of 10 years at 91.2% of minimal rated power output, 25 years at 80.7% of minimal rated power output. Renesola Modules confirm with PV standards such as IEC 61215:2005, IEC 61730:2004, UL 1703. Yingli Green modules are certified under IEC 61215, IEC 61730, MCS, CE, ISO 9001:2008, ISO 14001:2004, BS OHSAS 18001:2007, SA 8000, PV CYCLE. Read other technical details of solar modules of both the brands here: Renesola and Yingli Green Energy.